The big shift that needs to be made in education is to shift from knowing content to knowing learners. There are a number of challenges with this idea including technical and ethical, but having played with ideas that could potentially highlight aspects of a persons latent knowledge capacity the concept excites me. As part of my presentation I’ll be highlighting the ways the latest iteration of ALT’s Open Course in Technology Enhanced Learning (ocTEL) align to a Personal Knowledge Graph. One of the strongest features of ocTEL, which we completely fluked, was how Open Badges can be used to support the construction of part of a Person Knowledge Graph. As part of ocTEL the course was broken into weekly topics. Each week there were five types of badges available for that topic (this was based on the BlendKit Course). All the badges with the exception of TEL One and TEL Explorer were automatically awarded by a click of a button, entering an activity code or the system detecting a configured set of requirements. TEL One and Explorer were awarded by the participant providing a url evidencing their activity which was manually reviewed. Other badges were available outside the weekly set for community related activity. These included badges automatically awarded for adding details to a profile, making posts on other sites recorded in ocTEL as part of our data aggregation using FeedWordPress. There were also other badges tutors could individually award people to recognise contributions to the course. 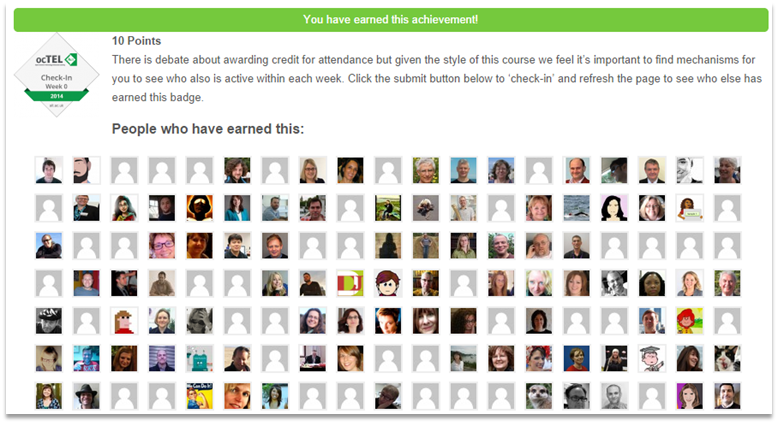 As part of the badging system there was an option to display who else had earned the badge. With this there is an opportunity to be aware of who else is active (an example badge page). 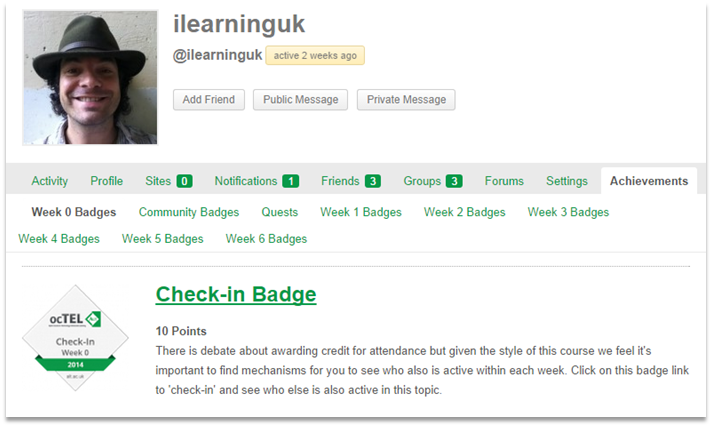 Given this was available on all badges activity become categorised by level (basic check-in to advanced activity) and topic. In the current configuration we have no made connections between these but would prove an interesting area for further research. Another area for improvement is the profile pictures link you only to the persons general profile page. Whilst this has uses, outlined below, in the case of badges with evidence attached to them this link isn’t exposed. A profile of what knowledge has been gained by an individual is arguably a key aspect of a Personal Knowledge Graph. The badging plugin used combined with the BuddyPress social network plugin integrates achievements into a person’s profile (an example profile here). This provides another entry point for people to make connections. Whilst BuddyPress has the facility for friend/follower relationships we were keen for participants to identify the personal 3rd party spaces they exist in. Another aspect of BuddyPress/BadgeOS we only briefly experimented with was the inclusion of badge award in the person’s activity stream. The main mechanism this could have supported is with a friending tie this activity could have been pushed to followers via email. One challenge of open or distributed activity is collecting that activity. ocTEL uses the FeedWordPress model to aggregate activity from participant blogs and other networks. Whilst the hashtag provides some means of collecting information from self-organising spaces there will always be issues with data collection. With the TEL One and TEL Explore badges requiring the person to submit a url as evidence that they have completed the activity this issue is partially overcome, the individual becoming the curator of information in their knowledge graph. The final aspect of badging in ocTEL worth noting is our efforts to move from the ‘digital badging’ natively used in the BadgeOS plugin to instead directly issue Open Badges. This small difference potentially has a big impact. Most notably this means the ocTEL site exposes information about achievements in the interoperable Open Badges specification. The benefit for the user is they can display badges in other systems, on a personal knowledge graph level it means these achievements are machine readable. This hastily written post hopefully gives you a flavour of how the use of Open Badges, or digital badging in general, could support the construction of part of a Personal Knowledge Graph. There are still a number of questions to be answered like how might Open Badges, a skills and competency definition using something like InLOC, and a Personal Knowledge Graph fit together. My slides for my IWMW14 talk, for what they are worth, are embedded below and I look forward to hearing your thoughts on this area. Bali_Maha: @timklapdor @KateMfD looking fwd to ur response, Tim! Do I know i from #octel or #blendkit2014 ? @timklapdor @KateMfD looking fwd to ur response, Tim! Do I know i from #octel or #blendkit2014 ? OK, so real life intervened and for the final 2 weeks of ocTEL I wasn’t able to participate as fully as I wanted to. I managed to pull in the webinars and did do some reading and thinking, but not as much writing and reflecting as I wanted to. However, overall this has been an excellent experience and given me some great ideas about where to go next. Immediate things on my radar are to start developing my portfolio for CMALT. I know I’ve got to get started on this, because life suddenly gets busier in September, having registered for an MSc as well as doing all my teaching (see separate blog post for more ramblings on this). I also came across some specific technologies that I want to start using this year, so I need to get those embedded into my plans over August. Lots to do, and never enough time to do it all! Huge thanks to all of the team at ocTEL – it was an excellent course and one which I’d definitely recommend to people!